A few months back, I was approached by a very sweet young lady about writing for Seasons at Home Magazine. She wanted to include some homesteading how-to's. I've had a subscription to the magazine before and so I knew that they did a exquisite job putting their time and talent into each edition. She requested that I do an article on one of the most basic canning projects, one that I have been doing pretty much all my life. Yay, that helps! The pictures from my Yes you CAN, Can Tomatoes are the ones I used for the article. 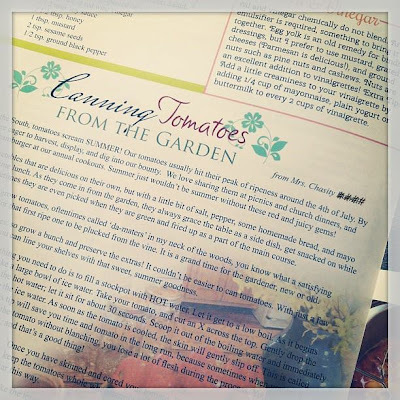 I called up a friend of mine to make sure I could get the tomatoes, because even though the magazine was going to be released in the summer, it was still spring when I had to put it all together. She was able to get me the tomatoes. I hauled out the trusty but hardly used tri-pod. Got my camera set up and went to work, capturing every step of the process. Then I got my creative spirit up and started writing. I wanted it informative, but also interesting to read. I am NOT the best at writing... so I just started trying to talk to a friend. It worked for me. Taking part in this magazine was great fun, I hope to do it again soon! Yesterday when the magazine was delivered to our mailbox, Eli excitedly read the article aloud for all of us to hear. You would have thought I had been a celebrity. The kids were thrilled for me. I was tickled for me, too. 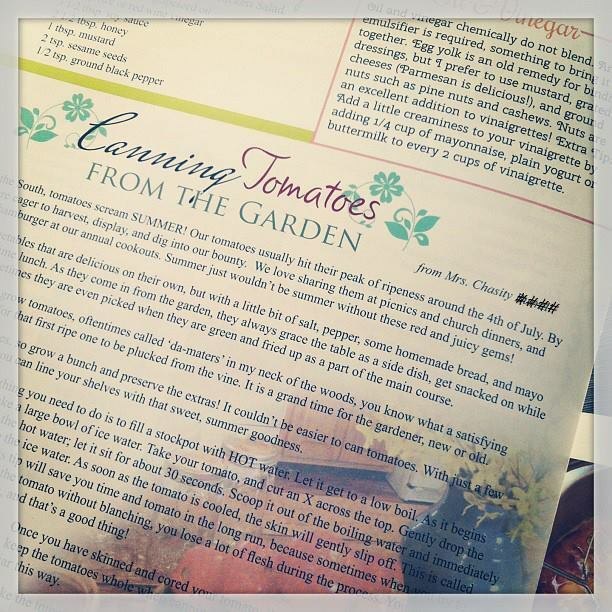 If you are interested in Seasons at Home Magazine, visit their website. Not only is my article in there, but there are PLENTY more wonderful ideas and activities. Seasons at Home Magazine is truly a work of heart. That is evident in the lovely body of work they put together. Oh I'm so happy for you. You do a fantastic job on all the sharing of recipes on your blog. And I can so see how the children would be excited for their Mamma. Have a wonderful day Chas. What can I do with all these tomatoes?